Work for Azure Machine Learning? Learning about Azure Machine Learning? "Good tool for users with limited programming experience but not very user friendly"
I like that people that don't have a lot of programming experience in languages like R or Python can use "templates" for running machine learning algorithms. This makes this tool available for non experts in the field. I dislike that the interface is not very user friendly. It took me a while to figure out how to connect the arrows and how the work flow works. I would like it to be more intuitive. I would recommned it too people with medium programming skills. For people that have enough tools to program wit out I would say there are more benefits of writting your own code. I am using it to run algorithms and test some machine learning models, and comparing them to stadard regression model using other software. "Azure ML is fun to use"
First of all, I must say that its interface is so pleasant to the eye and searching and dragging in the different components into the dashboard is fun. Configuring the modules is very simple, with a lot of features being preconfigured. Visualizing the results is also very neat and being able to publish the service as web API with minimal effort is so cool. So far, I don't find anything I dislike about Azure Machine Learning, but I must admit that my level of apprentice in this field is at a beginner's level. An intermediate to advanced knowledge of regression models, data sorting and cleansing, is a must, as with other machine learning software. Also comparing the different learning models, one another is definitely necessary to optimize the results. Recently, I was asked to perform some sort of prediction for a drugstore, based on data gathered through a web page survey, in order to rate their customers level of approval, and therefore try to forecast the coming months sales volume. After searching for different options, I found Azure ML and decided to try it out, after a while of going through the help guides and support pages, I started taken my first steps, testing and comparing different regression methods and data transformations, and when I started to get a hang of it, I realize how powerful this tool is. It has such a vast number of resources available, that makes it a must have. "Azure machine learning- easy ,friendly and powerful"
The automated processing of selected algorithms is impressive.The ease of which you can spool up new websites, databases, or even entire virtual machines is incredible. You can do in minutes what would take you hours to do on site. Setting up communication between resources is also quite easy.Command line tools support is on par with what an experienced developer would expect, the line of offering for different services is amazing and ever expanding and the customer support is there when you need it. Azure is amazing and has a wide variety but boy is there a learning curve. There is so much to offer and so much to do that the beginning user tends to feel VERY overwhelmed. I wish Microsoft did a better job at bringing people in gradually and had support that felt easy to interact with. System admins who are used to work in other platforms will take some time to adjust to Azure environment. Azure is a powerful could platform introduced by Microsoft and having reach features compared to other could platform available at the market. Azure provide feature reach platform for almost all business needs and when someone is considered to move their workload into cloud, Azure will be the best platform he might consider. "azure machine learning- easy yet powerful"
it has got a nice user interface, drag and drop components and connect them to build your model. you can also custiomize various components or code in python or R to have a custom component. it has nice interface to visualize data and easy to deploy your project. you can upload dataset from various sources . the best thing is its amazing interface. it also has cortana intelligence suite and other stuff wrth trying. it gets work done fast and easy. it trains the model fast. you have to have internet connection to use it.interface to code in python and R support is not good . a better interface to write code was expected. to use it, you need to know what you are doing. you need to have skills in data science and machine learning. it is easy to get started with and also comes with nice support . it has got cortana intelligence suite which is also helpful . if you have knowledge of data science and machine learning , it is must to try it once . you can upload dataset from various sources and train a model real quick just on the browser. it has great customization options to be used. it gives nice suggestions while selecting columns from dataset. i use it to create machine learning models with it for training various kinds of dataset available . it helps in creating recommender systems and other models . "A Balanced product for new bee, than experienced"
Trying to upgrade the package from trail gives you no idea about the subscriptions available. "Brief exposure to Azure ML was enlightening!" The automated processing of selected algorithms is impressive. Not much to dislike - I'm very impressed with the studio capabilities. So far I have not had a chance to apply it to a business problem, but that is due to the slowness of our internal processes - not Azure ML. "Azure is a high quality engine"
I appreciate the ability for azure to add in dimensionality to processing power. It is extremely power as a PAAS SAAS IAAS platform and allows users to determine on their own the best approach to the solution of their specific individual needs. I also like the quality with which Azure provides customer support and help assistance to clients. It is a robust platform with a robust user base. I dislike the price point at which Azure markets itself. It does not make sense to charge that much given their lower costs compared to competitors. Business problems such as ML can easily be solved using Azure. Azure provides a way to learn and segment data cleanly. This data storage site makes it easy to store large files needed in computer data analyses. The formatting of the files can be difficult to categorize. Currently working on extensive code to solve problems in data input. "Keeping up with modern technology "
Azure learning machine is an advanced form of technology that has allowed to crest datasets and view them in an highly organized manner. The only pitfall to using this form of technology is that it is not the easiest to understand at first. I had to maneuver through the tabular features before I could move forward. The project I most recently used it for was for a political campaign to reach voters. It was an essay way to organize registered voter information and create a dataset that made it easier to see all their information in one place. "Experimental POS project on Azure ML - smooth implementation"
The documentation could be better. Adding high amounts of training data takes time. As a POC product, this was very easy to use and quick to implement. We did a POC on an algorithm based data analytics. Used Azure ML as the ML service where we input our training data and then extract results from actual data. 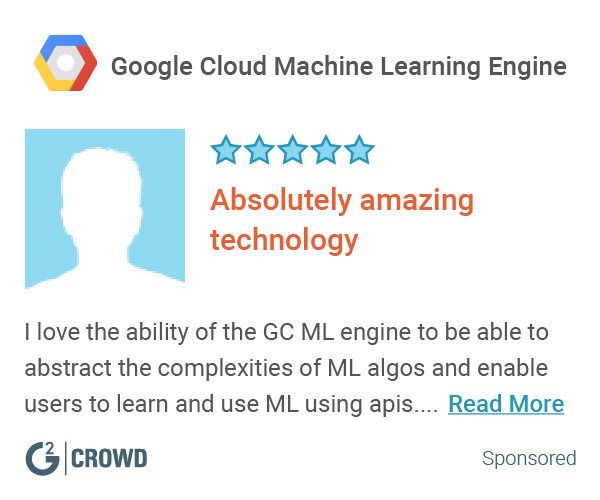 "Easy to use and excellent software"
"Good machine learning APIs to get you started easily"
I like its ability to analyze complex algorithms and come up with great correlations and regressions. It helps with analyzing large datasets and looking for correlations. "Spark, Docker, Cognitive Toolkit, TensorFlow, Caffe - many features supported"
I like Spark functionality - as real time data stream Azure helps in deep machine learning. Serverless, drag and drop development - Studio is awesome. still evaluating the product , will need to come up soon. "Smooth platform train and test your models with visualizing the performance"
I feel like a user has less flexibility to operate on his own when certain logic is to be employed. "Azure ML - User friendly high capability"
Azure comes with various connectors for ML and other advanced analytics tasks. We are trying to automate tasks based on subject of email using ML applications. * We monitor all Azure Machine Learning reviews to prevent fraudulent reviews and keep review quality high. We do not post reviews by company employees or direct competitors. Validated reviews require the user to submit a screenshot of the product containing their user ID, in order to verify a user is an actual user of the product. Hi there! Are you looking to implement a solution like Azure Machine Learning?